Two Washington, D.C., defense reporters do for nukes what Sarah Vowell did for presidential assassinations in this fascinating, kaleidoscopic portrait of nuclear weaponry. 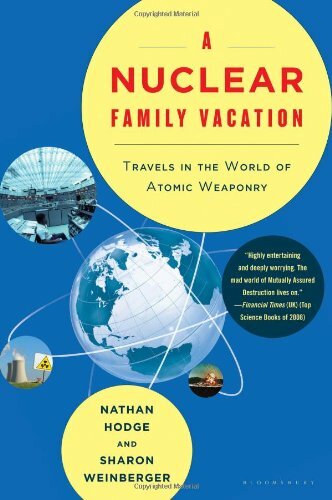 In A Nuclear Family Vacation, husband-and-wife journalists Sharon Weinberger and Nathan Hodge hit the open road to explore the secretive world of nuclear weaponry. Along the way, they answer the questions most nuclear tourists don’t get to ask: Are nuclear weapons still on hair-trigger alert? Is there such a thing as a suitcase nuke? Is Iran really building the bomb? Together, Weinberger and Hodge visit top-secret locations like the Isfahan Uranium Conversion Facility in Iran, the United States’ Kwajalein military outpost in the Marshall Islands, the Y-12 facility in Tennessee, and “Site R,” a bunker known as the “Underground Pentagon,” rumored to be Vice President Cheney’s personal “undisclosed location” of choice. Their atomic road trip reveals plans to revitalize the U.S. nuclear arsenal, even as the United States pushes other countries to disarm. Weaving together travel writing with world-changing events, A Nuclear Family Vacation unearths unknown—and often quite entertaining—stories about the nuclear world.